Review date: 9th May 1999. As I write this, 3Dfx's Voodoo 3 graphics boards and cards based on NVidia's TNT 2 technology have both just become available on the Australian market. The Voodoo boards are presently so expensive that one can only surmise they were delivered one by one on Learjets, but the TNT 2's aren't as pricey. The inevitable result has been that lesser graphics boards have taken another of those hefty price cuts that make staying a bit behind the cutting edge such a sensible thing to do. 3Dfx's Voodoo Banshee chipset wasn't king of the 3D heap even when it was new; it delivers roughly Voodoo 2-level performance on games that don't use multitexturing, and is rather slower than Voodoo 2 for multitexturing games like Quake 2. But Banshee boards do very speedy 2D graphics as well as 3D (a Voodoo 2 board has to be used in conjunction with a 2D-capable graphics card), and their quite fast 3D performance and reasonable price given them a well-deserved slice of the market. And now that Banshee boards are a couple of generations behind the state of the art, you can get them rather cheaply. I recently checked out Powercolor's oddly named Evil Queen Banshee board, and now it's possible to buy the V3200, an equivalently specified 16Mb AGP Banshee board from respected Taiwanese manufacturer ASUS, for $189 (Australian dollars). If you can live without the more impressive performance of a newer model card, this represents a substantial saving, not to mention great speed for the money. When I reviewed Diamond's Monster Fusion (review here) at the end of 1998, it cost $350 or so. The Fusion was a fairly early entry in the Banshee market, but the V3200's very much the same in performance. Half price, anyone? Cheap 3Dfx boards are a good choice for the impecunious gamer, because they support 3Dfx's proprietary Glide API, which is supported by pretty much every 3D game in the world, even the older ones. Proper support for standards that achieved popularity later, like Direct3D and OpenGL, is now commonplace but not quite ubiquitous. It's nice to have Glide. The V3200 is a well made board, as you'd expect from motherboard makers ASUS. Like other quality Banshee boards, it sports a low-profile heatsink and fan on the main chip. This cooler unit plugs into a header on the board and is held in place by a couple of little spring-loaded pins, so you can remove it if you want to add a chunkier cooler. There's a slim but comprehensive manual and two CDs - the driver disc, and a copy of Rage's somewhat venerable but still very visually impressive shooter Incoming. The V3200 installs just like any other AGP board. This means you need an AGP-aware operating system, like Windows 98. It's wise, under Windows, to switch back to the plain VGA video driver before you ditch your old graphics card, lest you find yourself staring at a black screen after installing the V3200. Apart from that, the driver installation is very straightforward. The drivers on the CD are fairly old and a shade buggy; you can get the current ASUS ones from here. You can also trade in the ASUS driver for pretty much any other vanilla Banshee driver that takes your fancy, if you want to try for a little more speed, or just want a different arrangement of gamma sliders and demo buttons on the graphics card control panel. Basically, a Banshee board is a Banshee board. The only significant performance differences between these video cards come from different clock speeds - goosing the core and memory clocks up above the default by using a utility like Powerstrip from Entech allows you to wring maybe 10% more speed out of conservatively clocked boards, or less from those already clocked a bit higher, like Diamond's Monster Fusion. The better the cooling of the card and of your case (see here for my monster fan case-modification project! ), the further you should be able to push the clock speed without getting video glitches and/or crashes. But actually spending time to wind up your video card that last 0.5% suggests, to my mind, that you might possibly be having more fun playing with the hardware than playing the games. The V3200 is a 16Mb Banshee board, which means it can support some rather impressive 2D resolutions. It can manage a 75Hz refresh rate at 1792 by 1344 with 32 bit colour. This is probably enough to stretch a startlingly expensive 30 inch monitor to its limits, and much higher than you should bother using on smaller screens like the 17 and 19 inch monitors many people use. Many of these monitors can accept a ludicrously high resolution input signal but don't actually have fine enough dot pitch to display it clearly. Fuzzy graphics aren't too annoying in games, but they'll drive you mad for anything else. Incidentally, the V3200, like various other Banshee boards, tops out at 1920 by 1440 for 2D and 1600 by 1200 for 3D. The latter setting could be useful for flight simulators and other games that don't actually push many polygons, but it's way over the top for games like Quake 2. 800 by 600 or 1024 by 768 is about as high a resolution as you want for these from a Banshee, even if you've got a shiny new Pentium III to help pump up the frame rate. If you're looking for bang per buck, this is it. For $79 Australian more than the price of a mid-performance yum cha older model card like Jaton's Riva 128ZX board (reviewed here) you get some serious gaming muscle, not to mention a lot more 2D performance than most users need. If you've a mania for the latest and greatest, you'll already have your hot little hands on the Voodoo 3 board you pre-ordered for a million and four dollars. But if you can live with a little less speed, your wallet will thank you. Colour depth: The number of distinct colours that a piece of hardware or software can display. It's referred to as depth, and sometimes as bit depth, because of the concept of overlapping, stacked "bitplanes", planar arrays of ones and zeroes that, together, define the colour of each pixel. The more bitplanes there are, the more bits per pixel, and the more bits per pixel, the more possible colours - number of colours equals two to the power of the number of bitplanes. 16 bits gives you 65536 possible colours, and 24 bit offers 16.8 million. Cards that do more than 24 bit use the extra bits for mixing channels and other funky stuff - 24 bit is more colours than the eye can discern already. This is significant for gaming, because running your games in 24 bit mode may be prettier, but will be slower. The image quality difference is not a large one; in Quake 2 you have to look hard to see the vague banding on walls in order to tell you're in 16 bit mode, and in a real game you don't have much time for that. Games with funkier engines that do fog mixing and similar tricks benefit more visually from 24 bit, but since going for 16 bit will let you run a higher resolution at the same speed, most gamers opt for fewer colours. OpenGL games inherit the colour depth of the desktop when you run them; if you're running 16 bit in Windows, that's what the game'll be. Remember this if you run your favourite game and it seems strangely slow; check your desktop colour depth. Direct3D games choose their own colour depth, and may or may not be switchable between 16 and 24 bit mode. Some, like Incoming, come in different versions for different colour depths. Direct3D: Microsoft's own 3D graphics Application Programming Interface (API), which serves the same function as OpenGL and Glide - programmers can use the API to get their software to work on any hardware with Direct3D support, instead of having to write their own drivers for every 3D board out there. Gamma: Adjusting the "gamma" of an image or of an image acquisition device gives you a way of brightening or darkening without losing as much detail as a straight brightness adjustment. Gamma adjustment works by changing the brightness of pixels according to how bright they currently are - the closer a pixel is to the extremes (black and white) the less it's changed, with the largest changes for pixels at the 50% grey level. 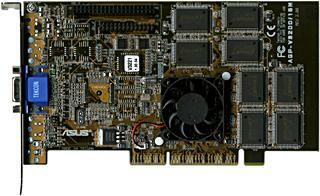 Glide: 3DFX's native 3D graphics standard, as used by the Voodoo cards of all flavours. When a game has rendering options that say something like "Standard OpenGL" and "3DFX OpenGL", the second option's Glide. OpenGL: The platform-independent 3D graphics interface standard, with different flavours developed by Silicon Graphics and Microsoft. Does much the same thing as Direct3D and Glide, but does it on any computer you care to name. Refresh rate: It's not enough that a given graphics system support the resolution and colour depth you want. It must also do it at a reasonable refresh rate. Refresh rate, measured in Hertz (Hz), is the number of times per second the screen is "repainted" with the image. Refresh rates below about 72Hz cause visible flicker; higher rates don't. Different people have different thresholds of annoyance when it comes to screen flicker, but staring at a 60Hz screen all day is an unpleasant experience for pretty much anyone. In gaming, refresh rate is not so critical, because you're generally not staring intently at relatively stationary objects in great fields of solid colour. But you still want 75Hz or so, if you can get it.